“Seeing Things”, he called the collection. He could be referencing the ever expanding landscape of lad culture and skate culture. He built his brand on those two aesthetics—or lifestyles for some, namely his customer. His silhouettes this season are looser: wide trousers with polo tops; cerulean half-zips with billowing white flares. The fluidity to the garments was evocative of a wider cultural shift, the fluidity of gender, but also the current generation’s affinity for the 90s and appropriating 90s culture on Instagram. The North of England endlessly inspires fashion and whiffs of that could be caught here. “Seeing Things” could also point to the irony in the collection. Was that a double-breasted, tartan coat with pointed lapels and exaggerated shoulders I just saw take the runway by storm? 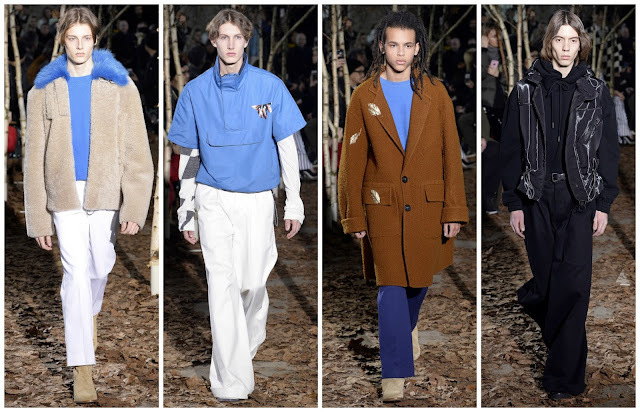 Intergenerational dressing was Demna Gvasalia’s agenda at his sophomore menswear collection at Balenciaga last Wednesday. The Georgian-born designer was looking at the businessmen arriving at the Balenciaga and Kering offices and translating this formal dressing to a generation of men about to buy into suiting. Abloh was entering similar territory. As I wrote last week, designers are desperately seeking to appeal to as many different customer groups as possible. To Abloh’s delight, his work is so intrinsically linked with youth that even if he matured his clothing they would still follow. Perhaps it was the 80s referencing that granted him entry—those crisp white pants; tapered teal trousers; sturdy anoraks in cool tones; a double-breasted black coat. These were the standout items for men over 40. The language and codes of streetwear aren’t restricted to those born after 1987, but universally applicable—who’s going to stop you from a fur jacket with a cerulean neckpiece with a matching sweater and white trousers, with the obligatory chelsea boots? Streetwear is global. Just a few weeks ago I spotted a teenage girl in my city wearing an Off-White hoodie. Jealousy aside, she looked great.